I totally forgot I had this photo, and, if this space is going to be where I record the history of my art, it must include this dinosaur, creatively named Blue and Brown Stars. Staring at this image brings out a flood of memories. This is what happens when one makes a quilt totally BY HAND!!! 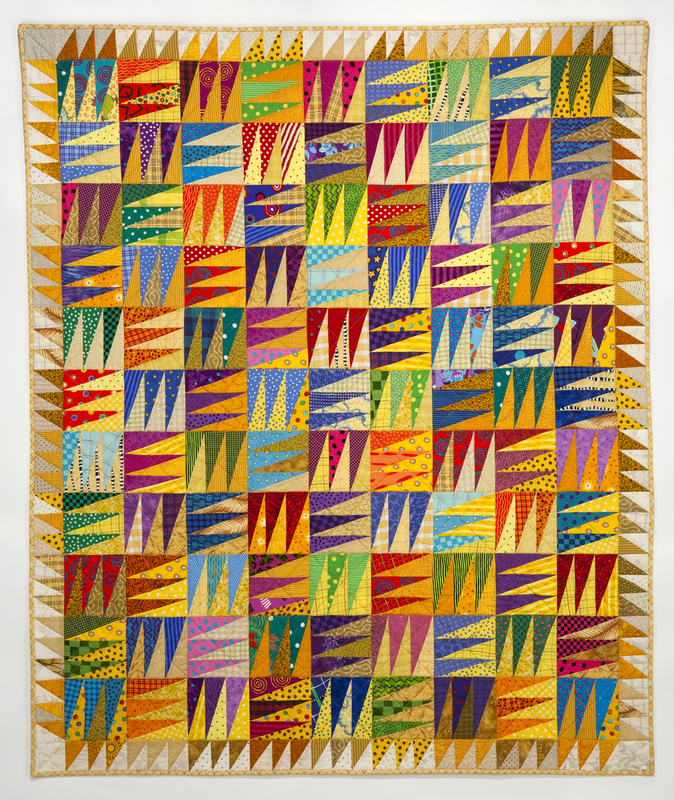 Sewn into the quilt is either a time or a place or a situation or a conversation or a person or an event or all of them combined. My memory of the timing of this quilt is sketchy. It was started sometime in the mid-1970’s, but I remember many of these emotional connections quite vividly. 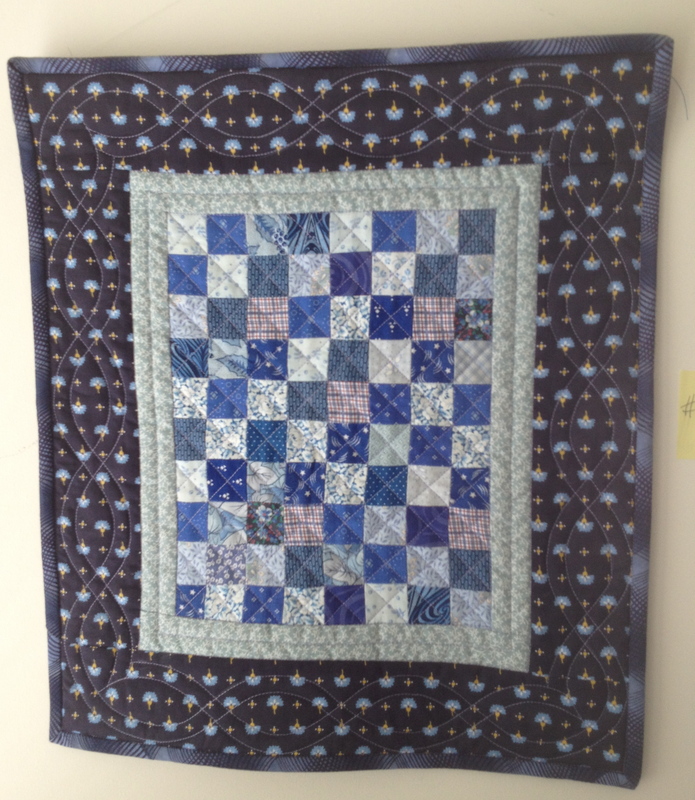 I had asked my friends who sewed to donate blue and brown fabrics to this project, and I received many, since I was working at a fabric store at the time I started, so I tried to get all of the prints into the quilt. One of my favorite pieces was the pima cotton brown check fabric found at Britex out of which I had made a shirt. Yes, folks, all ginghams used to be 100% cotton, says this ancient one, but they were getting rarer and rarer in the late 70’s. 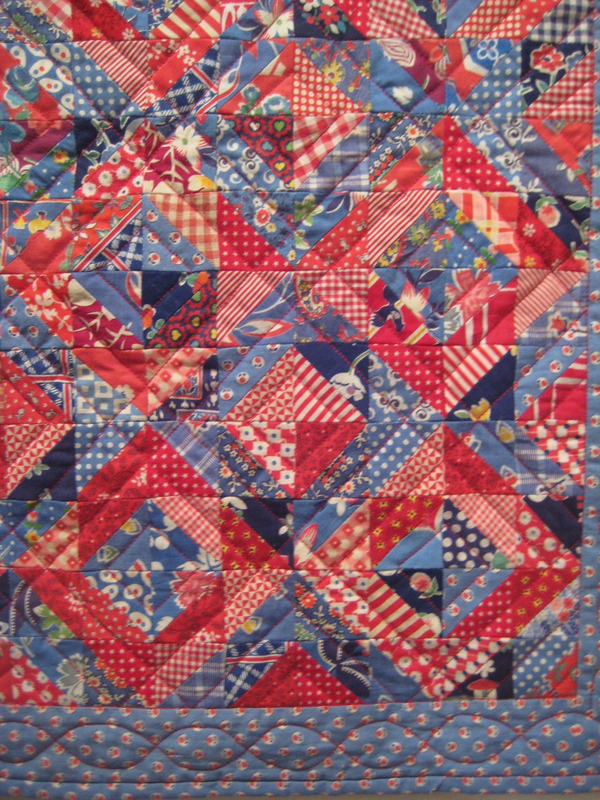 And good cotton muslin was the appropriate background for pieced stars, or almost any patchwork, for that matter. Also, let’s review the techniques involved here: I cut templates out of sandpaper, traced around them onto the fabrics, and cut out each piece individually. No rotary cutters here. And no design wall either; everything was laid out on the floor to see how the pieces would fit together. And then I began hand quilting. Since this quilt was made at a very busy time in my life, I can understand why quilting was not my first priority and took a long time. 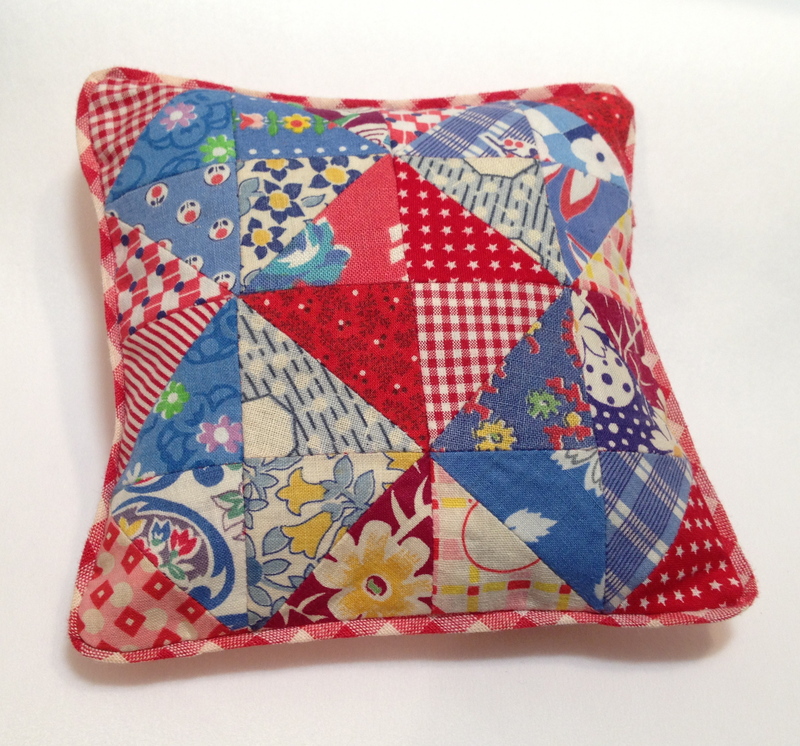 I know there is a zen to hand quilting, just like the hand embroidery, and I will still do these while I’m able. 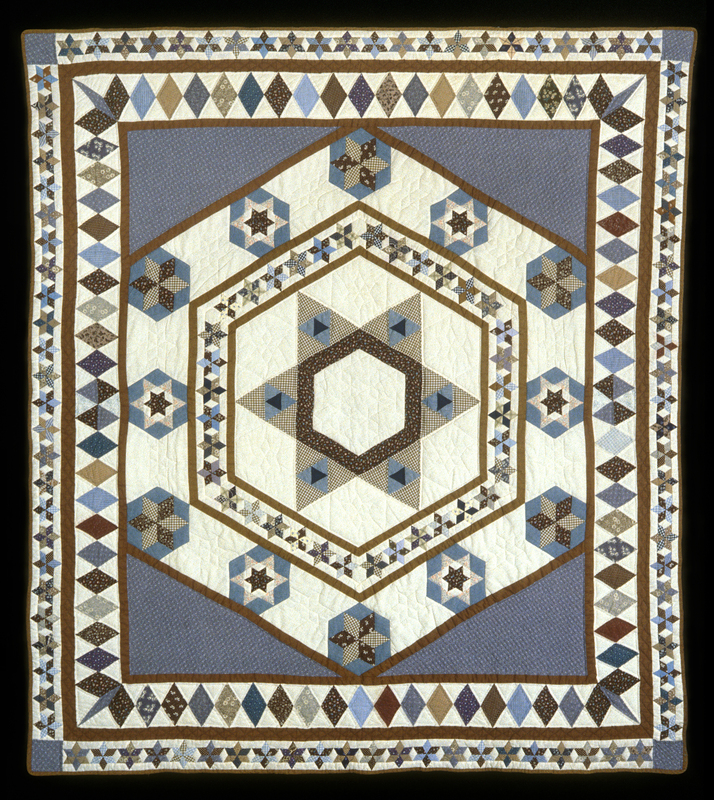 More recently I have become fascinated with the medallion format for quilts by working on more modern versions, and now I see the Blue and Brown Stars as the seed from which this fascination may have sprouted.
. . . .I did go through a doll phase with my daughter. Here are all the little quilts I found when I was making up the list of All The Quilts I’ve Made a few years ago. I had forgotten about these, and finding them was lots of fun ( and, yes, I did count them in the list of “quilts”, regardless of size). 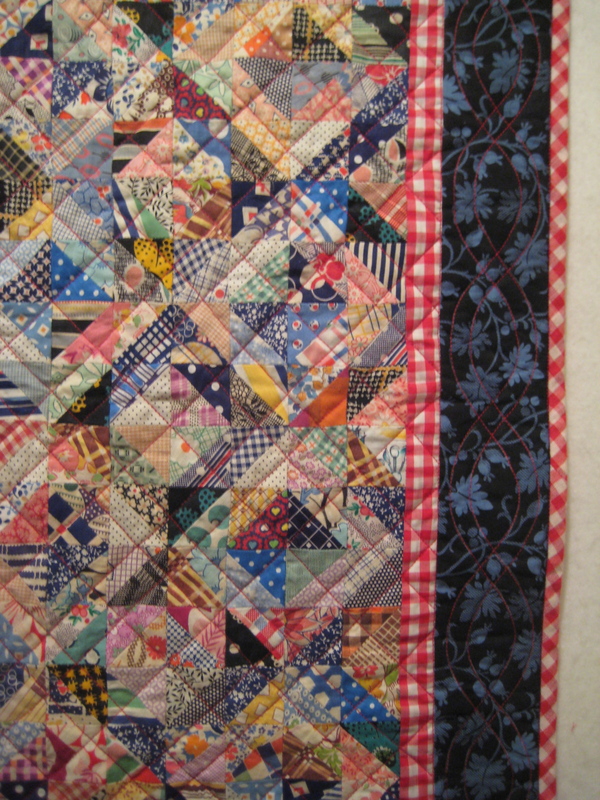 All three of the first quilts were made from vintage scraps. 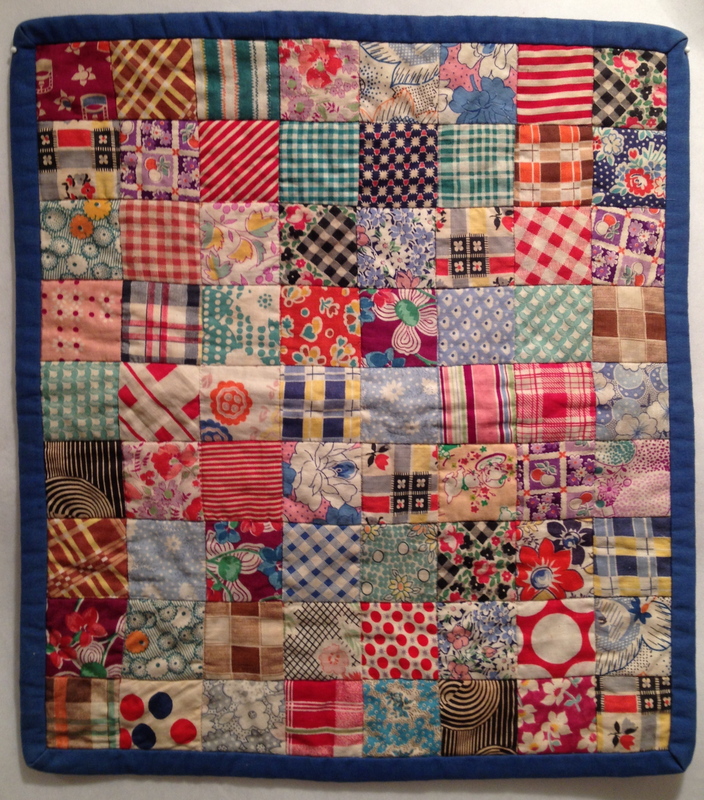 Turned out it was fun making these quilts, so I made another—for me. The only other miniature is one I made for Paul, so he could have one of my quilts in his office without it taking over the entire room. 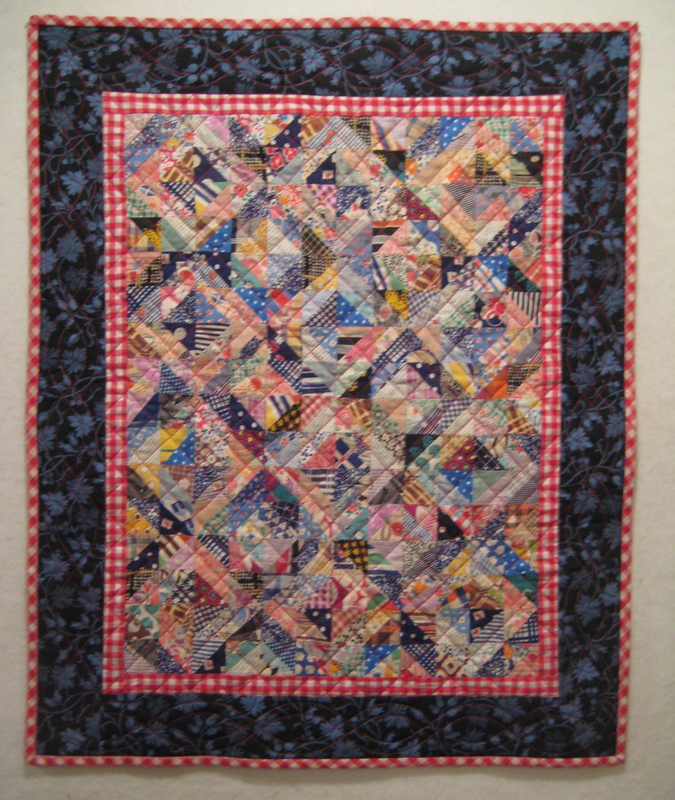 I learned about foundation piecing in a class taught by Jane Hall and Dixie Haywood at the Houston quilt show in 1994. These excellent ladies taught us five ways to make patchwork on various kinds of foundations and described all the situations in which these various techniques would be useful. The most appealing use for me at this time came from Jane: “If it needs to be perfect, use paper piecing.” I came away from their class with piles of samples, to which I can still refer when solving difficult piecing problems. Shortly hereafter, I got an opportunity to put this new skill to use. In return for piecing the quilt top I received an acknowledgment in the book, along with a book and poster, both signed by Kaffe. I devoured the book, and immediately made a quilt from my favorite (besides the one I made) Kaffe quilt. 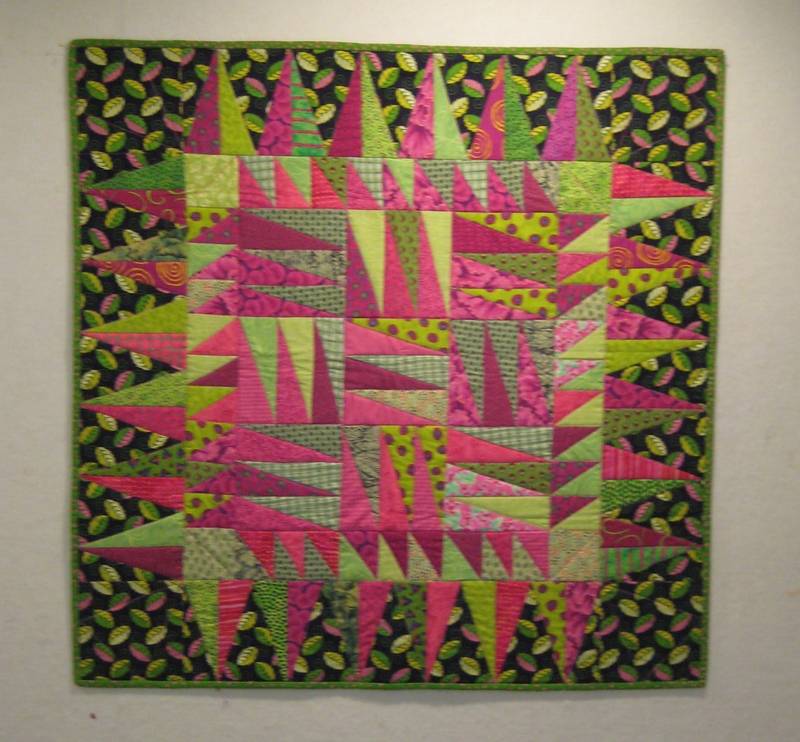 I was just beginning to use these wonderfully bright fabrics, so the Yellow Pennants Quilt (p.39) was a good tutorial for me. 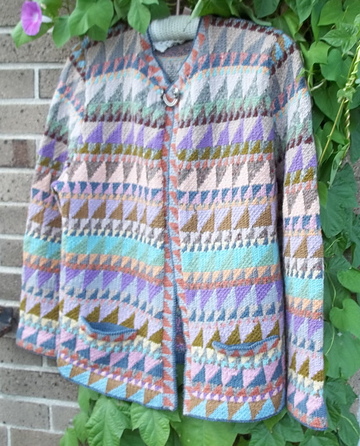 Great quilter Rebecca Rohrkaste once told me that if you want to learn to make color choices that you don’t usually make, copy a quilt you love, and you will learn a lot. Although she was referring to Amish quilts at the time, the message is still the true. 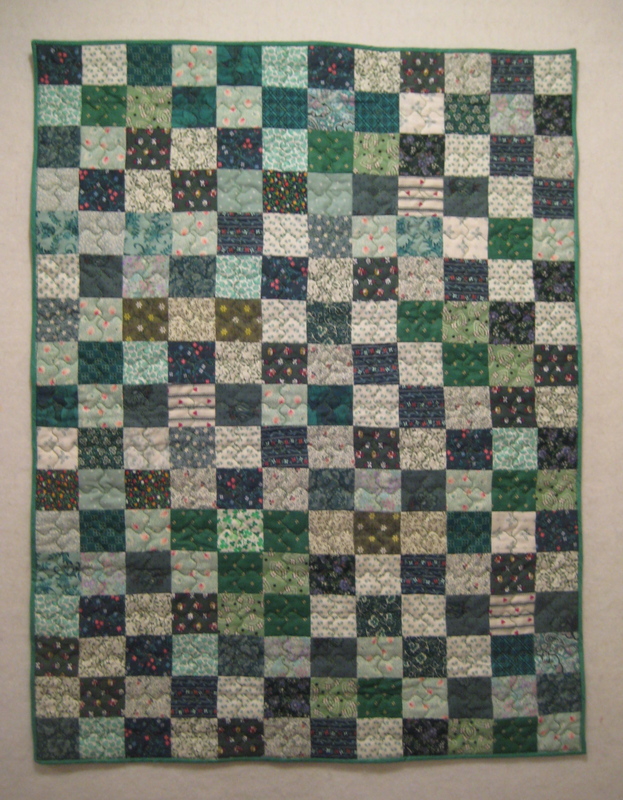 Kaffe’s quilt design included extra borders, which I found distracting, so I just eliminated them. Easy. And don’t forget to take a class. 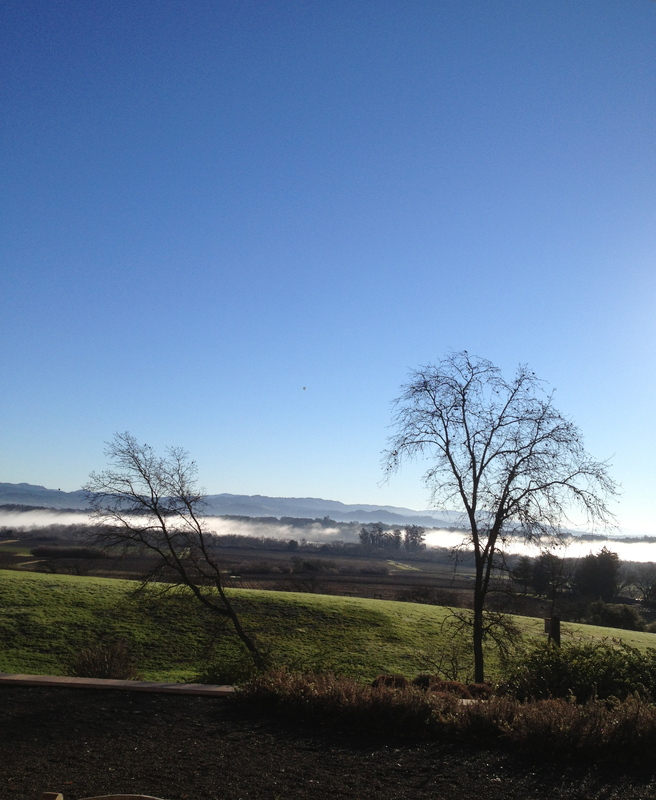 Having just returned from a wonderful four-night stay at an artist retreat at the lovely Bishop’s Ranch west of Healdsburg CA, my brain is slow to jump back into the fast-paced world of blogging, but I will make the effort. 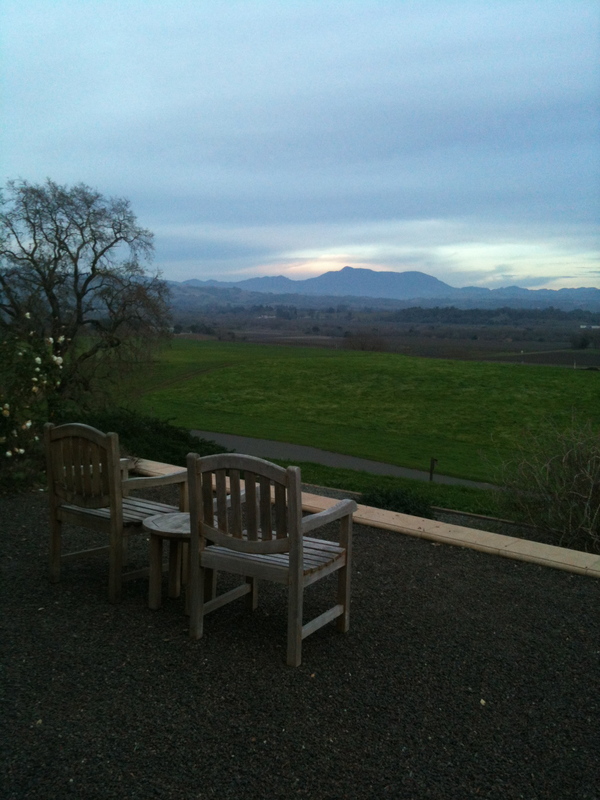 It was wonderful to spend an extended period of time in the company of all the talented and fascinating writers and quilters who made the trek to Sonoma County. On to quilt talk . . . While I was away, my husband slept under this quilt, which is another in the “seemed to make itself ” category. 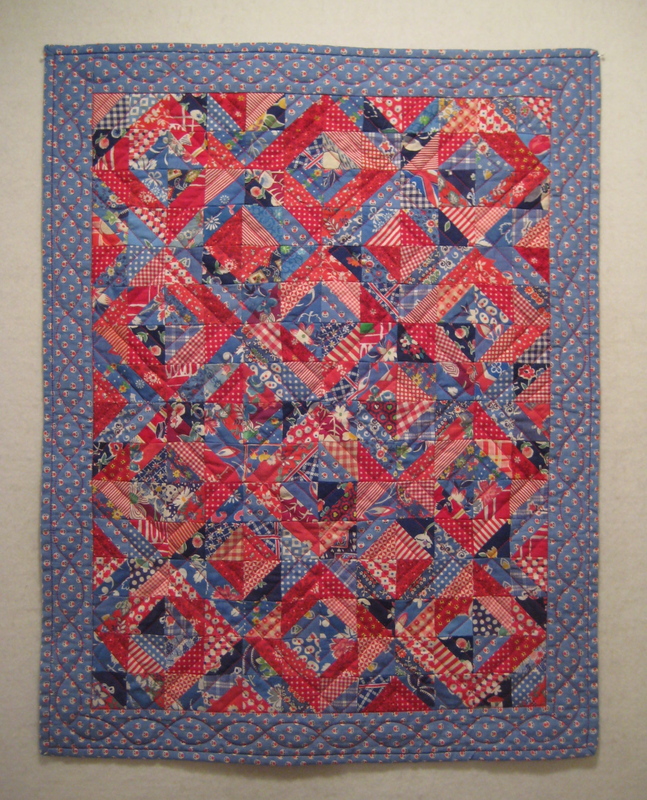 I wanted to make a quilt for Paul using his favorite color blue, and had been experimenting with triangle paper. (I guess that’s about the fewest possible criteria for the beginning of a quilt.) I found this pattern, the Double X, and used it for this quilt only because I could make exactly three blocks from the triangles generated from one sheet of triangle paper. I made piles of all my blue and yellow fabrics, started pairing them up, and made the triangles in record time. Then I got to play with all the great fabrics I could use for the centers of the blocks. 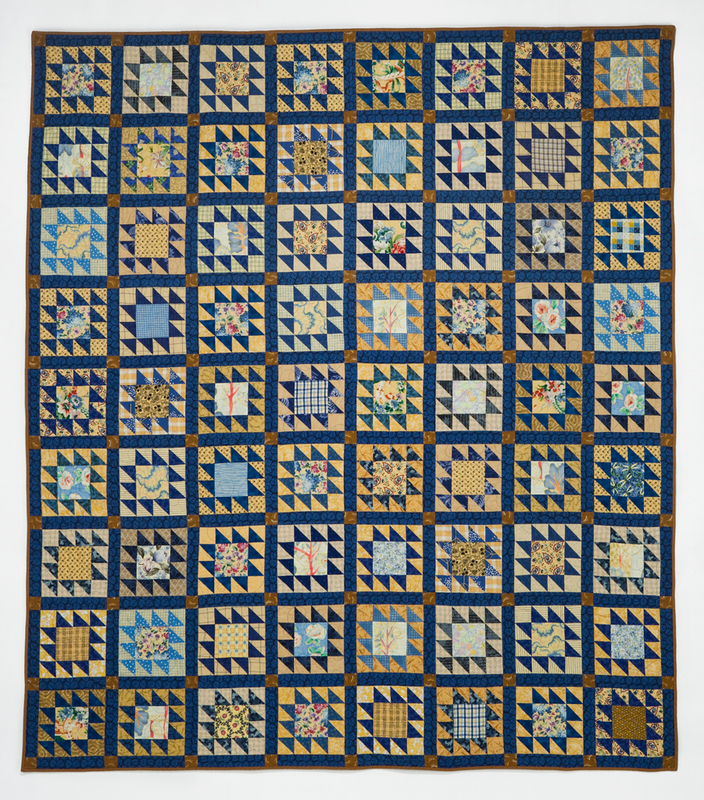 The real challenge for this quilt was the choice of fabric/color for the posts in the sashing. I auditioned dozens of swatches, and nothing worked until this dark gold was tried, which made the whole quilt come together. I have many quilts that hang on my walls, but this one is a “utility quilt”, the appellation reserved for the ones we actually use. I love these ones just as much. Now a dozen years old, it has served us well. 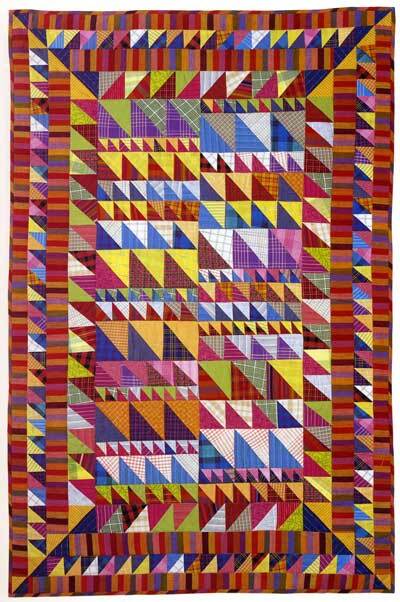 Often I can understand the name given to a quilt block pattern that has been handed down for generations. I don’t understand this one. I don’t see an X. If anyone else has ideas, please let me know. All images © by the artist, Susan Dague, and are not to be copied, reproduced or distributed in any manner. Eight small quilts; I’m back!! !